Oh man, I had secretly hoped for a small miracle when I took her to our favorite Doctor in the whole wide world yesterday. Our lovely Dr. W. However, he agreed with the local E.R. Docs and Ped. that she needs her tonsils removed and possibly adenoids as well. HOWEVER, I did find out that he uses a different technique than he normally does on his patients without cochlear implants than he does on the ones that do have the internal devices. 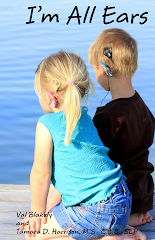 Certain instruments can't be used on the head/neck (at a minimum) with people who wear cochlear implants. Most of us received paperwork from the companies that made our children's devices that list cautions about such...monopolar instruments in particular. He will use the laser on her which will possibly make her recovery a little easier (he doesn't know her very well, lol) BUT it increases her chances of a re-bleed from 1% up to a 3%. I know these small chances mean nothing to some people but we take them very seriously because in the past, with the other child, we typically fall in those small percentages. He will also have her tested for the Angioedema we had Gage tested for. (Read here about the blood disease that runs in my family). So we wait about six weeks or so and let her enjoy her swimming (no swimming for 2 weeks after) and the big chunk of her summer before she goes in. I so dread this. She's way more dramatic because she's just like me and she's not been thru near as many surgeries as her big brother, so I'm sure this will call for extra support from the nursing staff to drag her back there when it's her turn to go into the O.R. She's a fighter so I hope they start working out now! But we have several weeks before we have to worry about all that! She should be all better by the time school starts on August 15. I tried to post a comment earlier, and it wouldn't work. I hope this one goes through! Thinking of you guys for B's upcoming surgery. I hope it goes smoothly and that she is a trooper through the whole thing. THe recovery is LONG -so stay on top of the pain meds! And lots of popsicles (honestly, expect a full two weeks for recovery time). Sending hugs your way! will be praying for ez recovery!!! and fast. no complications..and all of that. Dr. W just did my little boys surgery on Friday morning. Tonsils, tubes, and adenoids. I told my husband, Dr. W is the man because JL has been doing awesome! Dr. W also did our little princess's CI surgery. I think we need a family plan. Ha!